A new U.S. Customs and Border Protection facility was constructed over the past year, replacing a smaller structure at the end of the Ladner Road in Easton. The new facility contains energy-efficient features, including a wind turbine and solar panels. The larger building also provides more space for interviewing and detention purposes. 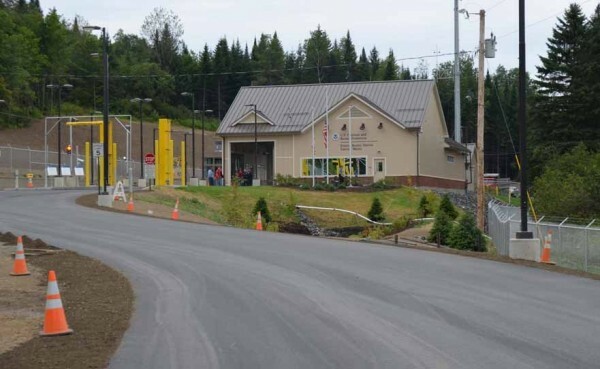 EASTON, Maine — A $6.1 million state-of-the-art facility now welcomes people coming to the United States from New Brunswick, at the Easton crossing located at the end of Ladner Road in River De Chute. “Construction began on May 31, 2011, and was completed on June 29, 2012, with a ‘go-live’ status on July 9, 2012. The project was awarded to Maine-based Sheridan Construction for approximately $6.1 million,” said Shelbe Benson-Fuller, office of public affairs, U.S. Customs and Border Protection. Construction was made possible by federal stimulus funds. “The American Recovery and Reinvestment Act of 2009 land port of entry modernization initiative provided resources needed for CBP to continue deploying the latest technologies that allow safe and efficient inspection of cargo and vehicles entering the U.S. and to improve land ports of entry, while promoting economic growth and job creation,” Benson-Fuller said. The port in Easton adjoins the Canadian port of River De Chute in New Brunswick. This new border facility replaces an outdated facility, strengthens security and facilitates legal travel and trade along the northern border. “CBP hired The Sheridan Corp. of Fairfield to design and build the facility in September 2010. The new facility officially opened to the public on July 9, 2012 — three months ahead of schedule. The new, 2,700-square-foot structure replaces a small mobile trailer that had been in place at the site since 2001. The older trailer, installed at the site shortly after 9/11, had seen better days,” said Edward H. Marsh Jr. of The Sheridan Corp.
“The Easton station was a small mobile trailer with approximately 64 square feet of workspace and was initially built … as a temporary facility and underwent little renovation, despite growing security requirements,” said Benson-Fuller. She said the former station, like many aging facilities along the U.S.-Canada border, had deficiencies that posed safety and security concerns for both the CBP officers and the public. “Specifically, the Easton station lacked potable water, a noncommercial inspection booth, facilities for noncommercial secondary inspections and facilities for interview and detention,” said Benson-Fuller. The new facility is one story, comprising approximately 3,739 square feet. The modernized facility includes the main port building, an inbound traffic inspection booth and canopy, and a garage. “Other site features include perimeter fencing, lighting, gates and other security measures,” said Benson-Fuller. The Easton station’s normal business hours are from 8 a.m. to 7 p.m. seven days a week, she said. Marsh said the new building sits squarely in the middle of where the narrow dirt road to the Canadian border used to be and the new road has been widened and paved to allow for two lanes of incoming and outbound traffic. “Traffic coming into the United States is routed through radiation portal monitors and then into an enclosed drive-through for inspection. While the port is not open 24 hours, state-of-the-art remote video surveillance allows CBP to monitor the crossing around the clock, and extensive site lighting turns night into day,” said Marsh. The project was designed by Sheridan and its team of architects and engineers to be certified LEED Silver under the U.S. Green Building Council’s Leadership in Energy and Environmental Design program. Benson-Fuller said the new building was designed to save money. “The Easton station incorporates LEED elements such as optimized energy performance heating and cooling systems to provide a 30 percent increase of efficiency over a standard building, enhanced commissioning and measurement and verification to ascertain that all systems are operating at designed optimums. The roofing material was selected to negate heat island effect of dark roofs. The solar panel system delivers 30 percent per year of the site’s domestic hot water needs. And a wind turbine/solar panels are used to generate clean, renewable energy,” said Benson-Fuller. She said the station is built with growth in mind. According to Benson-Fuller, the Easton border crossing handled 3,969 crossings in 2011, which averages out to approximately 331 crossings per month. The highest number of crossings per month occurred between June and September, which averaged about 455 per month.